"...The person in subject is a tall & lanky bespectacled (specs’ colour to revert) guy. 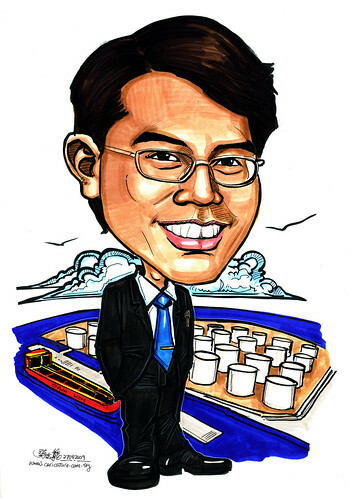 I would like the background to show a VLCC (Very Large Crude Carrier) in red & yellow – vessel’s name will be SAM KOH. The vsl is to berth against a terminal with its shore tanks visible. The person will be in a sharp & sleek grey suit, white shirt (? ), blue tie, black shiny leather shoes (? ), and in his shirt/blazer pocket, a mont blanc pen with a blue gem stone (will try to obtain a pic of it). Are the colour coordination ok? Pls also put in cuff links & tie pin if it will be shown. He is to carry a smug posture (but pleasant facial expression) if you’re able to capture that...."
When I saw the brief, first thing that strikes me is that the blue gem on the Mont Blanc pen will not be able to see clearly. I highlighted this to the client. True enough, It turned out as expected. I can only outline the pen to make it more visible. Thank you, Wai Pheng (the client). She bought me 2 boxes of little snacks with chocolate mousse within (upon her collection of the caricature). I don't know what you call them though. :) My kids love it!